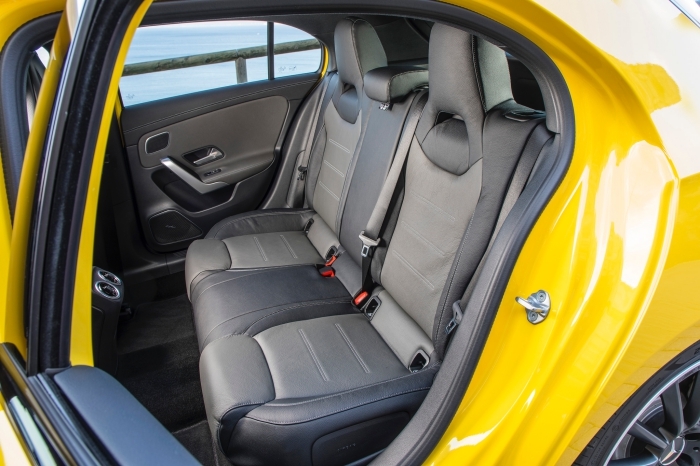 Mallorca, Spain – Which is the best small hatchback? If you go by individual model, it’s the VW Golf. If you go by the whole model range (hatch, wagon, MPV, hot hatch, super hot hatch) err..it’s still the Golf, what with the excellent Variant, Sportsvan, GTI and Golf R.
Mercedes will never triumph VW in the value-for-money race (not that it should, or wants to), but when it comes to accomplishment – price aside – it’s getting darn close to the world’s best hatchback. 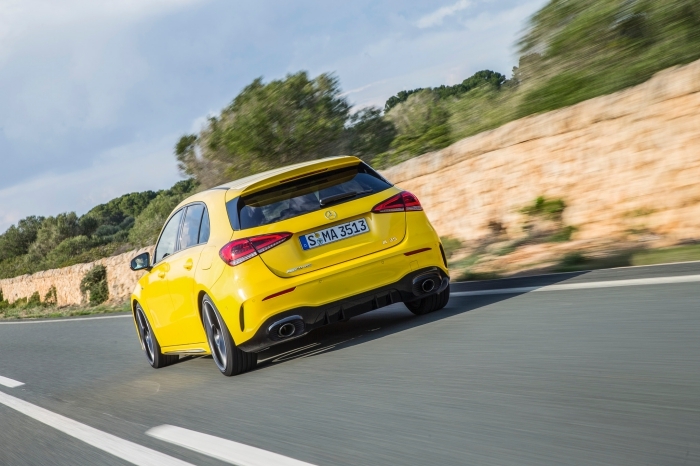 The new A-Class is proof enough, for the baseline, and while the B-Class is still not the sort of thing a keen driver would choose the first time, there’s this: The new Mercedes-AMG A 35. 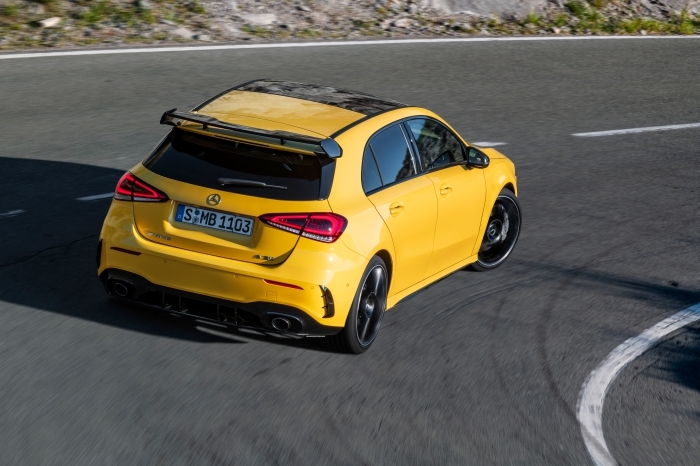 The smaller number, and the power figures, denote that this isn’t a replacement for the unholy terror that is the Mercedes-AMG A 45 (based on the second-gen A-Class). 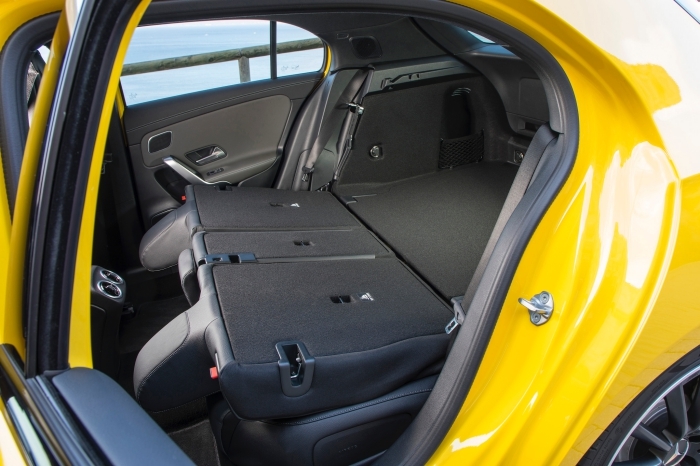 The current third-gen one has yet to be revealed, but the A 35 can also be considered the in-between car that Mercedes should have made instead of the diffident A 250 Sport of the second-gen. 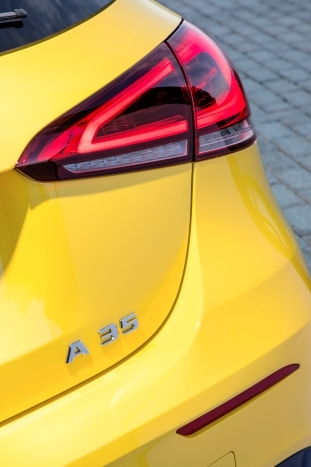 In fact the ‘35’ moniker could be the future term for warm-AMG compact models (e.g. 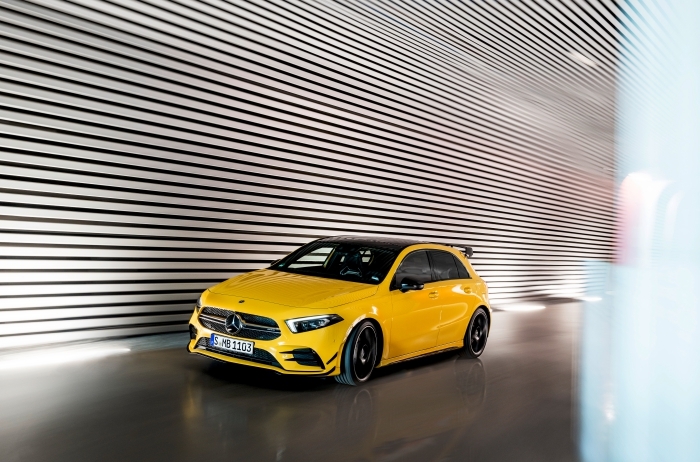 a sporty version of the next small four-door coupe, a CLA 35) just as ‘43’ denotes that for C segment models, and 53 for higher-ups like the CLS, all meant to see off the challenge of Audi S and BMW M Peformance models. That explains the Goldilocks power figure of 306hp. 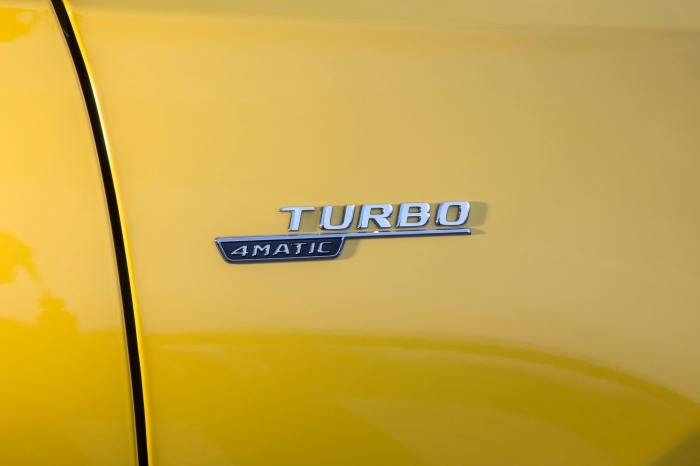 There’s a 1991cc engine again, but Mercedes says it’s totally new, developed from the same engine that powers the current A 250, except fettled, massaged and blown to engorge its power and torque. 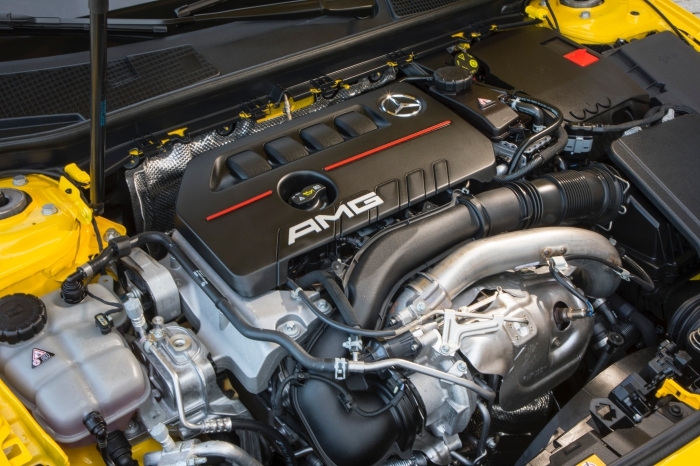 A larger twin-scroll turbo fed with parallel inlets (each cylinder bank takes a turn feeding the turbo for better gas flow) plus new cooling and intake systems account for the major updates, and as a mainstream AMG car, the engine isn’t hand-assembled (it would be too slow to make and hence more expensive). 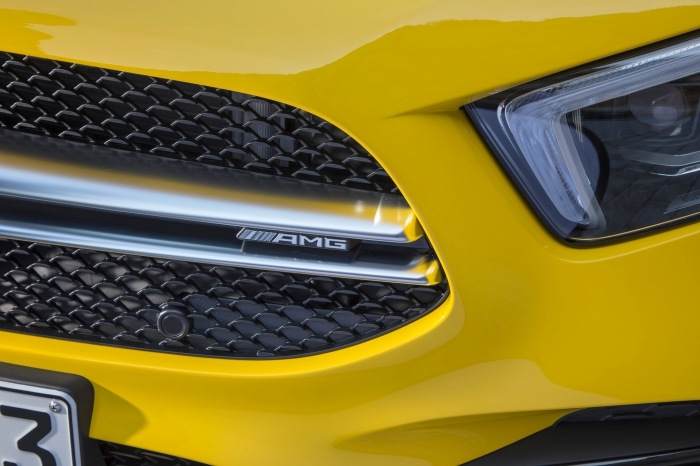 Chassis changes include a small increase to track (though no widening of the body, the shell is the same as the standard A), AMG designed components and tuning, adaptive dampers, stiffer steering, engine bay reinforcement and struts for better front end feel and stiffness. 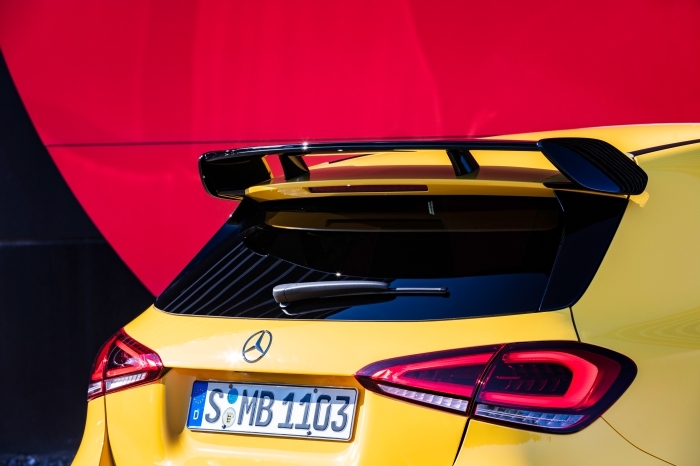 An optional Aero Kit is available, which adds the big rear wing, larger front and rear splitter ‘wings’, plus side winglets on the front and rear, though Mercedes-AMG declined to say how much downforce this all adds, if any. 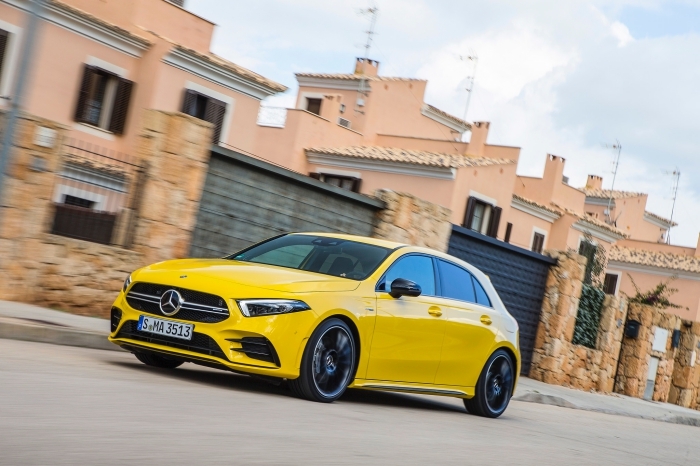 There’s also all-wheel drive capable of 100 per cent front torque, and up to 50 per cent to the rear, thanks to a rear-mounted electronically-controlled differential – Mercedes-AMG says it’s even quicker to respond than the hydraulic system on the A 45. 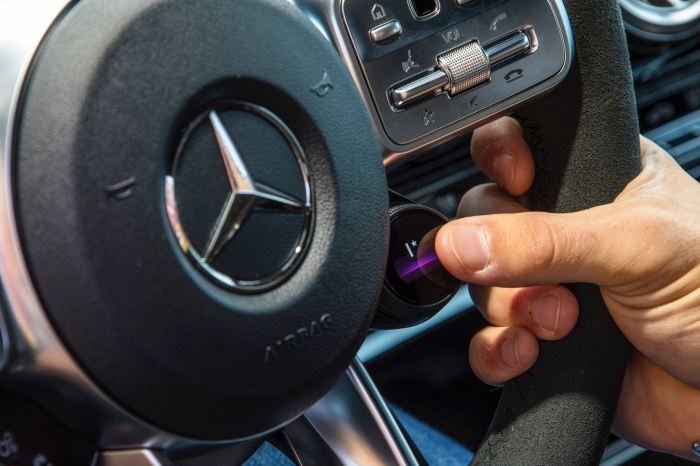 The power delivery is surprisingly smooth – no surprise as the torque curve is almost table flat – and much of the peak 400Nm is generated from near tickover. Yet the A 35 doesn’t so much pick up speed with a violent punch, so much as whoosh forward when you blitz the throttle pedal. 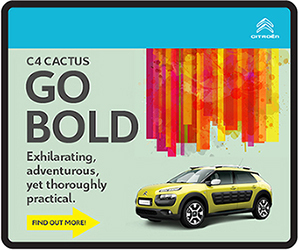 It’s fast, but doesn’t feel madly so – even if the speedo and lift-off crackle says otherwise. 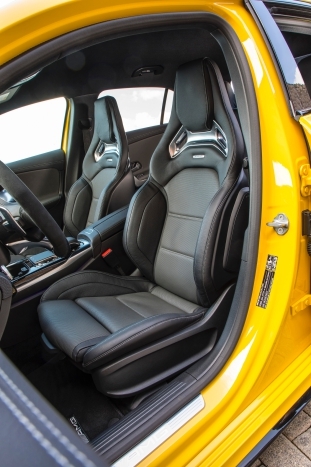 Mercedes-AMG, like BMW M, has gotten very consistent when it comes to a unifying feel of the cars across its range, and the 43 cars have an underlying current of taut ability, the chassis feels stiff and ready to g-force the issues of cornering and acceleration, but there’s also restraint, composure and flex. The A 35 drives like a 43 car: Accurate steering lets you place the car well, firm brakes give good feel, you can conserve momentum through the corner since the car handles roll so well, but if you feel more speed-needy, just brake later, fire out early riding on the AWD traction. 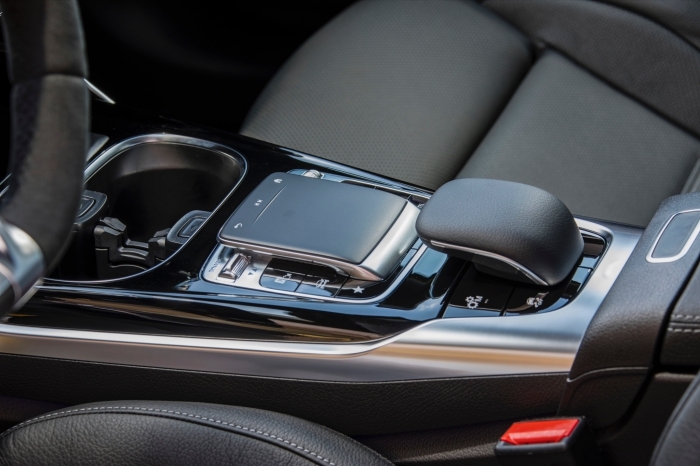 There’s more latitude to tweak the car to suit your own driving style and wants as well: There’s a new mode, Slippery, that joins Comfort, Sport, Sport+ and Individual. 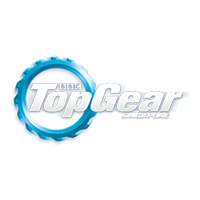 As usual you select from three levels of tuning for chassis, steering, engine, gearbox and ESP. 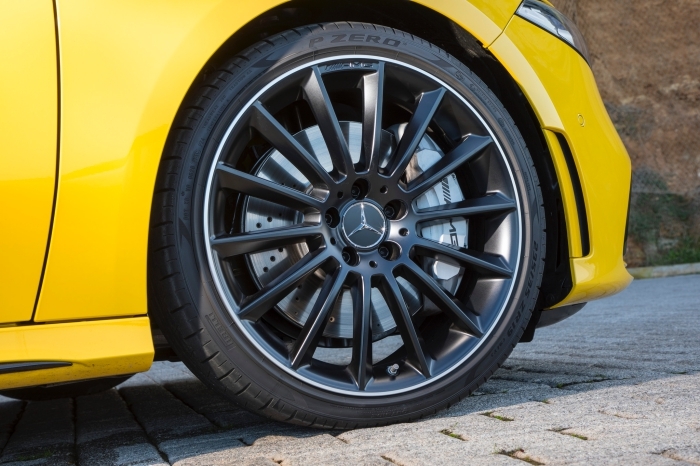 But there is also a new AMG Dynamics option, which has two levels, and controls the aggressiveness of the yaw-helping brake-based torque vectoring system. 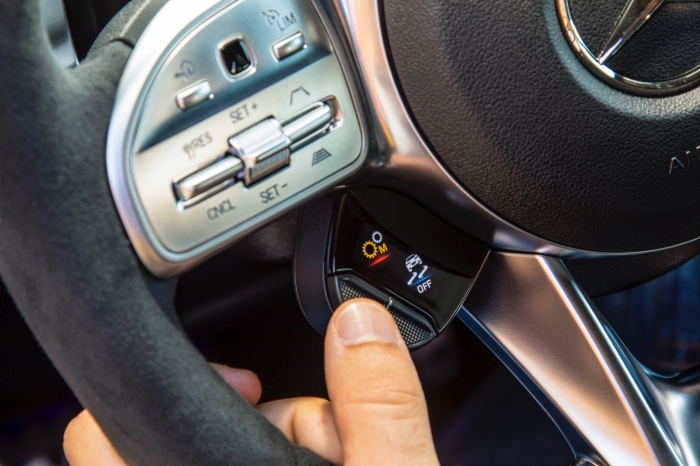 The cool thing is you can fiddle with that all without taking your hands from the wheel thanks to a new mode selector, and two driving settings buttons you can customise for category, all three buttons have tiny built-in screens that look very high tech as well. Like a good hot hatch, the A 35 is tremendously fast over roads of all sorts, and we encountered just that in Mallorca, from narrow, almost-side-scraping lanes in towns and hills, tight reducing radius hairpins, to wide sweeping bends and fast esses. 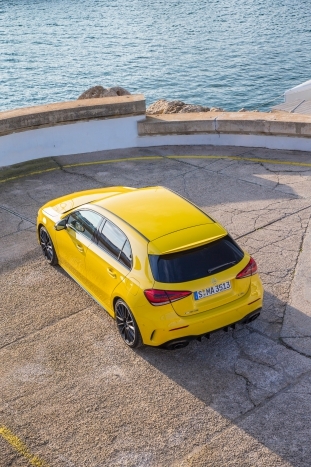 It’s no A 45 in terms of manners, as it’s actually quite polite as far as 'hot' hatches go. It’s fast, proper fast, but it doesn’t smack the breath out of your lungs as it gathers speed. 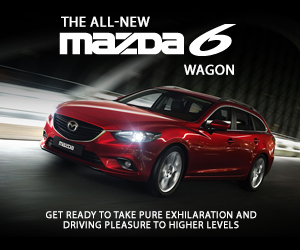 All manners point to something more poised and accessible, and less intimidating to drive, not in least because it’s one of the best-riding hot hatches around – you simply don’t feel bumps with any violence. It actually reminds us of the VW Golf GTI Mark VI (hooligan gone to obedience school but still hooligan), as opposed to the VW Golf GTI Mark V (unrepentant hooligan), or the A 45 AMG (gangster basketcase). Along that line, we would have enjoyed a little more rowdiness (AMG says there’s no sport exhaust option yet) and more steering feel, but the key value of the A 35 lies in its accessibility. 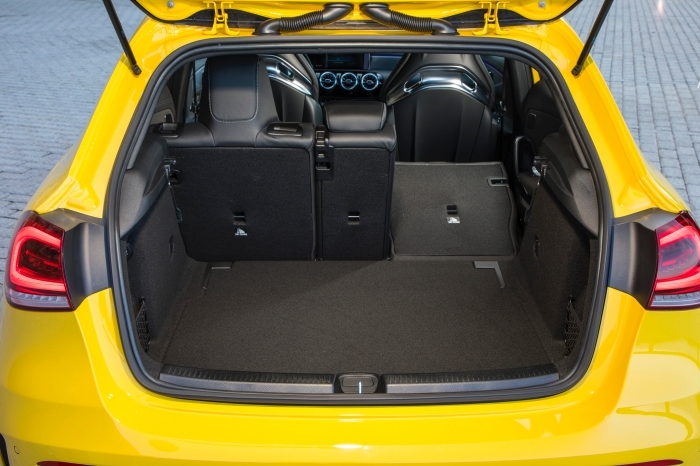 Here’s an AMG hatch you can finally drive day to day without flaming your license or your SO’s patience away. It’s perfectly civilised in traffic, and rides well too, and by our reckoning should be much further priced to the S$200k with COE mark than the near S$300k the A 45 asks for. 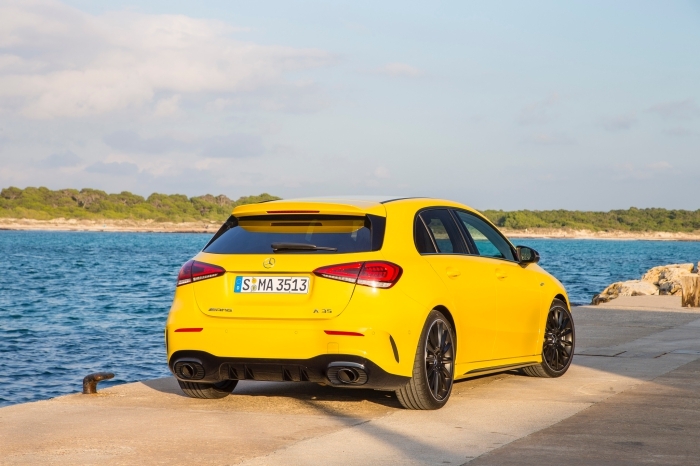 The third-gen A-Class has truly come out of the shadows into hatchback glory, and the A 35 is proof of that it could be bound for more on the hot end of things.